The study of astrology can provide keys to an understanding of life that brings enlightenment and personal empowerment. There are several options offered here you may find quite helpful in your exploration of modern applications of this ancient subject. 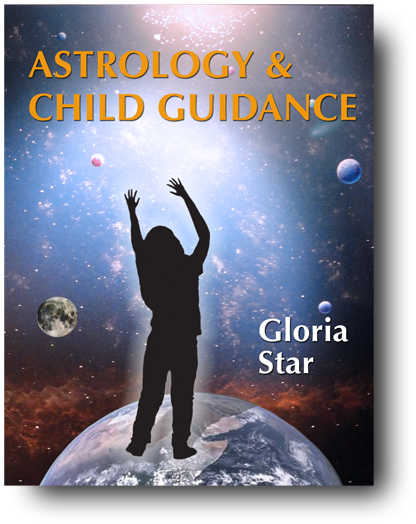 ASTROLOGY & CHILD GUIDANCE, the newly revised, edited and amended version of Gloria's landmark book, Optimum Child — is now available as a E-Book. If you want to attend a class, but simply do not have the time or opportunity to find a convenient option, you'll find a wide variety of previously recorded astrology classes. You can choose from an extensive library available in mp3 format, and each class includes visual illustrations you can download in PDF format. You can, of course, play the audio of the mp3 class using your computer's media player, your tablet, smartphone, or personal digital music player (iPod, etc.). Webinar workshops are also available for download. The material in Optimum Child was first published in 1987, and was later revised, expanded and adapted into another book, Astrology & Your Child (2000). Later, this material was further adapted into two different computer software programs. Now, the new E-Book edition is further edited and expanded, with more illustrations and an easy-to-follow format. ASTROLOGY & CHILD GUIDANCE is written for parents, teachers, and others interested in exploring many of the dimensions of human development through the lens of astrology. It matters not if you're new to astrology. All the fundamentals are explained in this book. I am pleased to offer an assortment of audio recordings of my lectures and workshops presented over recent years. I've included material for every level of astrological expertise, so I hope you'll find something that will work for you. Offered in mp3 format, these are easy to download and save digitally in whatever medium you prefer. Whenever possible, I am also packaging handouts to accompany the lectures and workshops, since astrology is a visual experience! The handouts are all in PDF. I have written several informative computer-generated astrological reports and two are available for purchase. These reports are based upon your unique astrological chart, utilizing your date, time and place of birth. You may order reports directly from me. I also sell the software for these reports, should you be interested. Please contact me if you wish to know more about Astrological Reports and software! I currently offer two personally authored reports.